Posted by Automagically imported from Blogspot on January 4, 2010 in Uncategorized | Comments Off on Finally Back! Hi Everyone! I have been away for a couple months (too many Christmas presents to finish) but I am back. I loved these blocks. 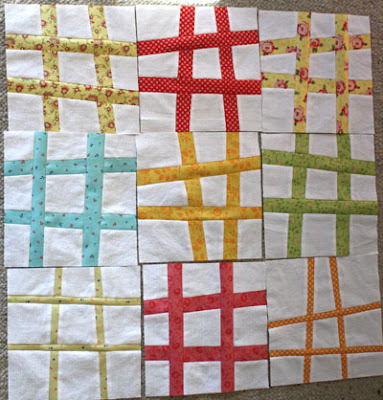 I am hoping to get a quilt top finished this week to show you in which I used the idea of these blocks if not the exact block… well you will see. Here are my nine. I hope they are bright enough. Sorry for the terrible picture.